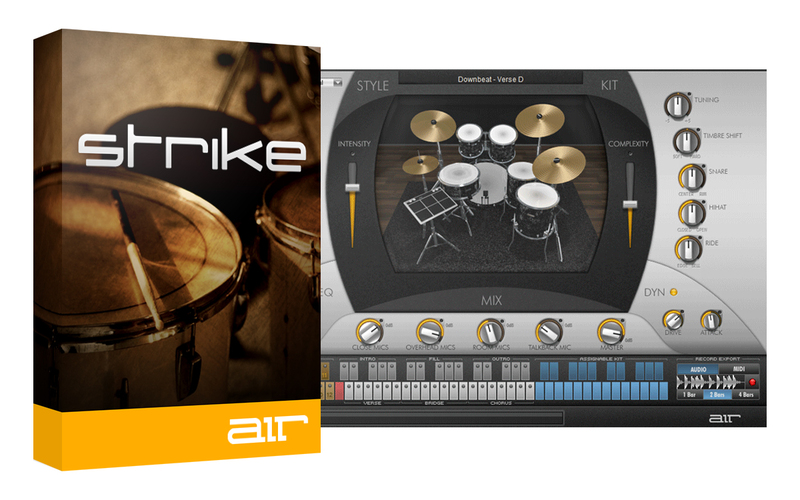 Strike is a dynamic drum and arranger instrument that features a world-class sample library and a hyper-realistic performance engine. Strike puts you in the producer’s chair, enabling you to create, control, and produce professional drum tracks with uncanny human realism. 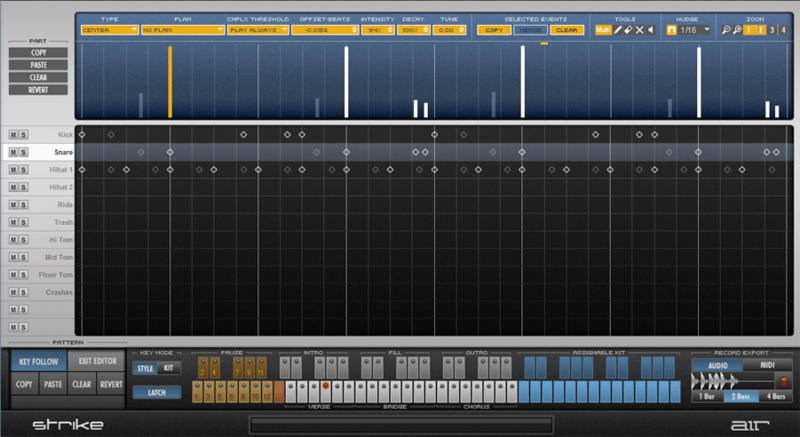 With its proprietary technology, Strike surpasses conventional MIDI programming and drumming sampling when it comes to computer-based playing, arranging, and mixing of drums. Use Strike to play a seamless crescendo, switch drum kits from ballad to crushed punk, or tweak the tuning of the snare drum. Each instrument was recorded with up to three close, two overhead, and two room microphones. 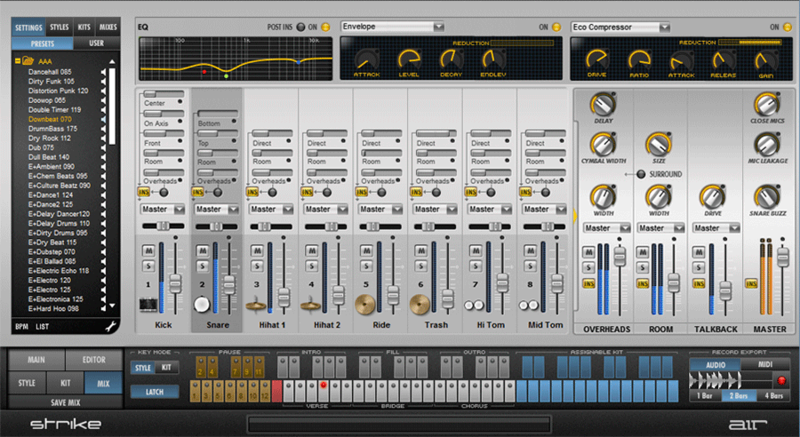 Strike also provides a full mixing console, complete with built-in effects. With Strike, you can create professional drum tracks by choosing one of the high-definition kits and telling Strike how to play: Adjust the intensity, complexity, timing, groove, and dynamics of your drum track — all in real time. Strike also supports automation enabling you to program or record changes to any one of its parameters: Connect a MIDI controller to tweak your performance on the fly using knobs, sliders, and drum pads and then play it back to hear dynamic results. Strike’s proprietary real-time performance engine eliminates the mechanized artifacts of typical sample-playback devices to deliver human results with unparalleled realism. The playing intensity can be increased to obtain a smooth dynamic response in the drum tone instead of audible velocity switches. With Strike, you can produce professional drum tracks that are impossible to create with conventional sampling technology. Strike comes loaded with 19 customizable drum kits that were recorded at the world renowned Blackbird Studios in Nashville, Tennessee. Choose from an RnB acoustic kit, to a funky acid jazz kit, to a big reverb-drenched 80s kit. Strike lets you create your own custom drum patterns with the onboard Style Editor and can function as a drum module in your DAW. Additionally, Strike supports WAV and AIFF files so you can use your own custom sample libraries. 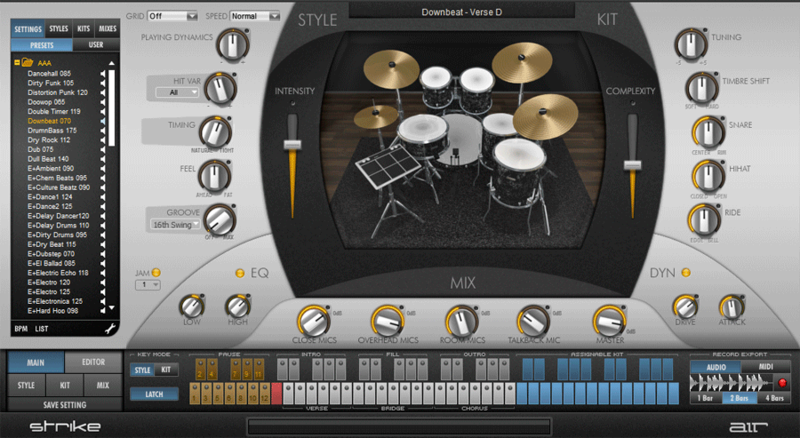 Whether you compose soundtracks, pop tunes, or just need a drummer to jam along with on your guitar, Strike delivers human results with thousands of editable preset patterns in popular music styles. To help you get the perfect drum sound, Strike includes a built-in mixing console for full control over every aspect of the kit. Change virtual microphone settings, such as room ambience and leakage, then take advantage of dedicated 3-band EQ and two insert effects per channel. The onboard effects range from dynamics and limiting to reverb and delay, plus specialized tools such as bit crusher and filter. The onboard mixer lets you easily adjust the overall level and panning for each drum, and route individual sounds to separate mixer channels in your DAW.